Tokyo 2020: Stars of baseball, surfing, skateboarding & karate? Ever heard of Mick Fanning or Shohei Otani? Know your bouldering from your shortboard surfing? After Tokyo 2020 put forward the sports it wanted to include when it hosts the Olympics, BBC Sport takes a look at the contenders for a gold medal. America may have the World Series of baseball, but did you know the US are not even the best team in the world? Japan are ranked number one, while South Korea will be defending Olympic champions from when it was last played in Beijing in 2008. Baseball is the most popular sport in Japan and their star is Shohei Otani, a 21-year-old pitcher who plays for the Hokkaido Nippon-Ham Fighters. It is also the most watched sport in the world with the USA's Major League Baseball and Japan's Nippon Professional Baseball leading the way. 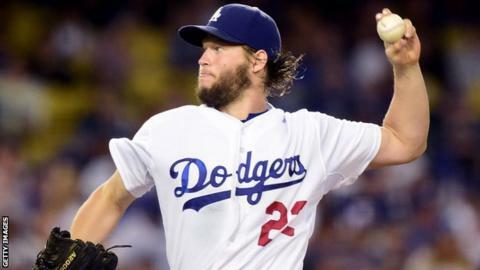 The world's best players could add a gold medal to their fortunes - America's Clayton Kershaw of the Los Angeles Dodgers is the highest paid player in the MLB, earning an estimated $31.2m (£20.5m) in 2015. Great Britain are ranked 25th in the world, while Netherlands - in fifth - are the top European team. Women would compete in softball, which uses a larger ball than baseball. Japan are the current world champions and reigning Olympic champions. Not many athletes can add 'fighting off a shark' to their CV, unless your name is Mick Fanning. The Australian, who in July escaped a shark attack in South Africa uninjured, is a three-time surfing world champion and could be a headline act if the sport makes the cut for Tokyo. He would not have to worry about sharks in Japan as organisers are likely to use a wave garden, an artificial lagoon that creates man-made waves for the competition. Competitors would use a shortboard and be judged on their speed, power and flow. In the women's event, 23-year-old Californian Courtney Conlogue could be the one to watch. She is currently the number one-ranked surfer on the women's world tour. One man who might miss out in 2020 is 11-time world champion Kelly Slater, considered the greatest surfer in history, who will be 48 by the time surfing could make its Olympic debut. Know your ollie from your half-pipe? If not, you need to brush up on your skateboarding lingo as the extreme sport could be rolling into Tokyo. There will be two events: street, which consists of urban obstacles such as rails and ramps, and park, a combination of street with half-pipes and bowls. The US are kings of the concrete and boast skating pioneer Tony Hawk, who is famous for his self-titled video games. Hawk will be 52 in 2020, so it may well be American multiple X Games champions Chris Cole, currently 32, and Nyjah Huston, now 20, battling it out for gold. But a 25-year-old skater from the favelas of Porto Alegre in Brazil will be aiming to stop them. The story of Luis Oliveira's upbringing - from survival in the slums to contesting world championships - reads like a movie script. If he can land gold in 2020, it probably will be. Canada's Sean McColl may well be the man to ensure the Olympics gets a head for heights. The 28-year-old, a regular on US television's American Ninja Warrior, is a three-time overall world champion in sport climbing, which involves three disciplines - bouldering, lead climbing and speed climbing. Or, as the sport's governing body puts it: "The missing vertical dimension to the world's most prestigious sport event." Bouldering is climbing without ropes up or over a boulder or small rock formation. Lead climbing is contested in a time limit, with competitors attaching themselves to pre-placed clips along a route. In speed climbing, contestants try and ascend a set distance in the fastest time. They would compete in a sports arena or sheltered outdoor area with live commentary and music. "It's a really amazing spectator sport," McColl told BBC World Service Sport. "You see them climbing and think "oh, it looks kind of easy' and you see the holes they're holding onto and they're just half a centimetre wide and they're throwing their bodies around, so it's actually a really spectacular sport." Rafael Aghayev is known as "the Diego Maradona of karate". When you're often referred to as "the Diego Maradona of karate", you have to be quite good at what you do. It's fair to say Azerbaijan's four-time world champion and nine-time European champion Rafael Aghayev is quite good. As Argentine Maradona lit up football stadiums with his genius, 30-year-old Aghayez - nicknamed "Pantera" for his fighting style - has been creating a buzz in kumite, a contact form of karate. The martial art, which has never been an Olympic sport, originated in Japan. There are two events: kata, which are detailed choreographed patterns of movements, and kumite. Despite Aghayev's recent dominance - he starred for the hosts at this summer's Euro Games in Baku - France are currently the top-ranked nation across the two events, with England 27th, Scotland 56th, Wales 90th and Northern Ireland 116th. Japan topped the medal table at the 2015 World Championships, with Egypt second and France third.